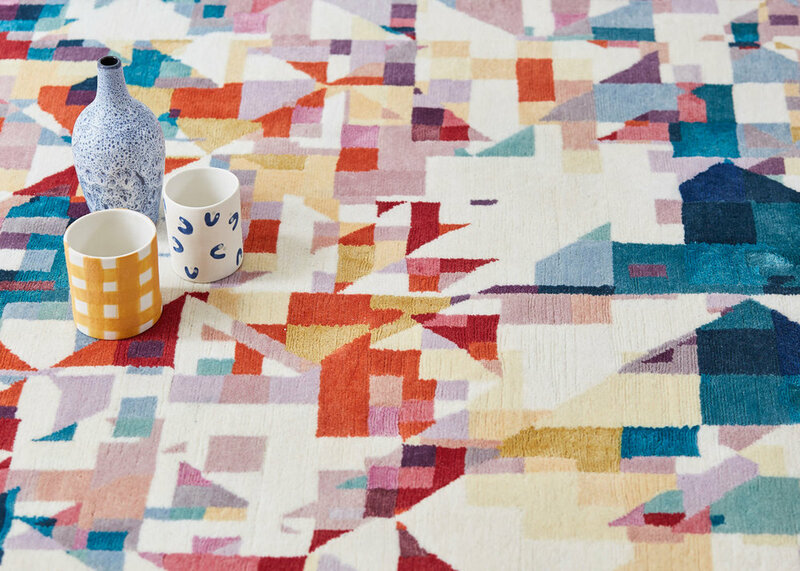 We were so excited when the opportunity arose to work with the wonderful FLOOR_STORY, having always admired their work and their selection of pattern we jumped at the chance to see some of the Flock classic patterns translated into beautifully knotted rugs. The design we chose to use for this particular collaboration was Rachel Parker's Northmore pattern, which was no easy feat to translate! Rachel's original design contains hundreds of colours which would have been impossible to directly copy and so Rachel painstaking reduced the colour count in her design down to 26 which is still a whopping amount when it comes to rugs. From there together with the Simon from FLOOR_STORY we carefully matched ink colours to wool samples to select the perfect palette for the rug. This beautiful thing is an incredible work of art, hand knotted in Tibetan weave by some of India's finest rug makers, each piece is made to order for you and takes 12 weeks to complete. Debuting with FLOOR_STORY at this year's London Design Festival you can find the Northmore rug on display at Design Junction, West Canopy stand 21 from 22-25 September.